In 1988, All My Children’s Joey Martin had a lot of growing up to do. So did new portrayer Michael Brainard. Only a month shy of what should have been Joey’s tenth birthday, then 23 years old Brainard got his big break when he took on the role of the youngest Martin son at the annual Martin family Thanksgiving dinner. “The other guy playing Joey [Michael Scalera], he was playing the part two weeks before I got there. They grew him up to my age,” Brainard said. “I was super poor. It is hard to imagine, but I was. There would be times I would go two or three weeks without work. I was eating peanut butter and jelly sandwiches and hanging out in Central Park,” Brainard said about his first year as a working actor in New York. Behr had wise morsels for Brainard’s portrayal. “She told me, ‘You are young and you are stupid,” Brainard said. “Having been as young as I was, stupid was something I was familiar with.” Brainard looked to other actors as an influence on his new character, “When I was as young actor, I watch all of Jack Lemmon’s movies. I mimicked his bumbling sense of humor for Joey,” Brainard said. -Brainard on his first year as "Joey"
“I showed up in the nicest clothes I owned: a black pair of slacks and a Cosby sweater. In all the photos, I am the only one wearing a sweater,” Brainard said about his wardrobe decision. Brainard stood out in the crowd, especially to his new boss Behr. Brainard felt lucky to be part Pine Valley’s first family, the Martins, with original cast members Mary Fickett (ex-Ruth Martin) and Ray MacDonnell (Dr. Joe Martin). “They were very much the patron and matron saints of the show. Back then, there was also Susan [Lucci, Erica Kane] and Ruth [Warrick, ex-Phoebe English]. They were all very tight knit and close, but it did not take long before you were part of that family,” Brainard said. Brainard's first big story revolved around his onscreen mariage to Emily Ann (Liz Vassey). “When I went back for the anniversary shows, they were my favorite people to go back and see,” Brainard said. Brainard and onscreen brother Knight were famous for their comedic interludes. “Working with Michael meant I was trying to find something funny in that moment. We would bat things back and forth. Michael was a big help,” Brainard said. “It was said that he was going to leave [in 1991]. He was a good friend. It was sad he was not going to be around anymore… and the rating dipped when he left. He was very popular.” Knight would return as Tad in 1992 and has remained with the program ever since. As Joey began to air more consistently Brainard began to be recognized in public, but not to the same extent as some of his co-stars. “Maurice Bernard (ex-Nico Kelly) was on the show playing Nico. He was a year or two older than I was, but in a different category since he looked older. He was Nico, the owner of a nightclub. He was seen in a certain light, and all the girls would love him and scream like he was a rockstar,” Brainard said. 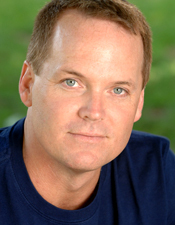 Brainard finally became a younger leading man in the summer of 1990 with his onscreen romance with Emily Ann Sago (Liz Vassey). “Felicia knew I was working hard and a good guy, and so far as her giving me something, I fit into this. Here I was, a good character. Let’s use him,” Brainard said. At the conclusion of the story in 1991, Brainard was again facing an uncertain future on the show. “It gets really young adult oriented in the summer when the school children were out of school. David and Melanie [Rampal, Paige Turco], they were a summer thing and they were gone. With Emily Ann, it was a summer thing that carried on to September. Then they had to move on,” Brainard said. Emily Ann was sent to Oak Haven Sanitarium after her descent into madness. Back in California, Brainard started auditioning but needed to refocus. After the casting director form The Young and the Restless called his agent because he did not take a screeentest seriously, Brainard put himself back in gear. His agent sent him to read for the role of Ted Capwell on NBC’s Santa Barbara. “I promised I would turn it around… and I got it. It was for Paul Rauch. He made me wait to see more people, but they still gave me the part,” Brainard said. "You don’t have a tuxedo! You are Joey Martin. You have rugby shirts and jeans." - Wardrobe's reaction to Brainard's request to borrow a tuxedo. Life as an actor was not always easy. Brainard’s fondest memories on set did not have to do with the story he was working on, but what was going on around him in the real world. “I was there onset when the news came down that we invaded Iraq the first time. I remember James [Kiberd, ex-Trevor Dillon] coming down the hall asking if I had heard. In 1988, Tieneman square happened. We watched all the live feeds from China. We had the network feeds and could watch five screens on one tv. That was a heavy day. It had to effect the work,” Brainard said. Sometimes the reality of the situation was even closer to home. “I was onset at Santa Barbara when Magic Johnson announced he had AIDS. A Martinex (ex-Cruz Castillo) was as big fan, he has season tickets, and he knows Magic. He stuck his head out his door, and look down at me. He could not say a word,” Brainard remembered. Work onset would continue despite what was going on around them. Santa Barbara was cancelled in 1993. Brainard saw it as a sign for him to reevaluate his career options. “At the time, I was completely out of the radar of television. I was learning different things. I was enjoying a different life,” Brainard said. The weeklong celebration that drew back over a dozen All My Children alumnus concluded with Fickett’s announcement that she was going to not renew her contract with the show. “We did not know it was her last day. I don’t know if anybody did. She worked a little after it,” Brainard said. A year later, the show recast the role of Ruth with Lee Meriweather. 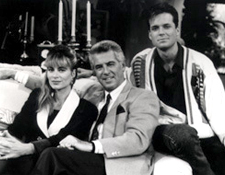 Brainard with his Santa Barbara family Eileen Davidson (ex-Kelly) and Jed Allen (ex-CC). “Sometimes a soap, it is like owning the Boston Red Soxs. You have to make decision to run the team, but you also have to pay the piper if you do something the fans do not like. They are a big part of the equation,” Brainard said. “There is a prevailing view that the fans would like what you give them. In 1996, the show also recast the role of Joey, now going by Jake, with Michael Lowry. Brainard was not approached to fill the role. Brainard continues to act in Los Angeles. He is a constant in the local theatre scene. Like many in the industry, he is also starring in direct to web material. He continues to star in movies, and most recently returned to serial television with MyNetworkTV’s American Heiress. “I was waking up every morning and driving to set. It made me want to do it [a series] again,” Brainard said. “I haven’t said that in a long time.” Brainard has also made a name for himself as a woodworker. In 2007, one of his pieces was featured on the cover of the Los Angeles Times Calendar Section with Grey’s Anatomy and Private Practice star Kate Walsh.